Tempo Swing allows to change the duration of each invidiual row of a beat in modern tempo mode. 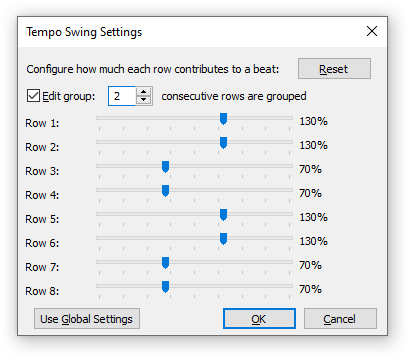 Tempo Swing can be configured globally for the whole module (in the Song Properties dialog) or per pattern (in the Pattern Properties dialog). Independent of the current tempo and speed settings: Tempo Swing still works after a tempo change. The duration of all rows always adds up to the intended tempo. VST plugins receive a steady tempo instead of constant tempo changes. Tempo changes sometimes confuse the internal delay lines of plugins. It is always synced to the start of a beat in the pattern. No need to fill patterns with tempo change commands which can be moved around accidentally, etc. Finer control than tempo change commands. This dialog shows as many sliders as there are rows in a beat. The number of rows is configured in either the Song Properties (global) or Pattern Properties (per pattern) dialog. Move sliders to the right to extend the length of a row and to the left to shorten it. Enabling the edit group will divide the sliders into two groups of the specified size. All sliders belonging to the same group are moved at once. So if the edit group size is set to 1, every other row is moved together, if it is 2, every other group of two sliders is moved, etc. When editing the swing settings of a single pattern, the Use Global Settings button can be used to copy the global swing settings to this pattern. This page was last edited on 14 November 2016, at 15:31.